Scooper - Technology News: Who will help China fight deflation? 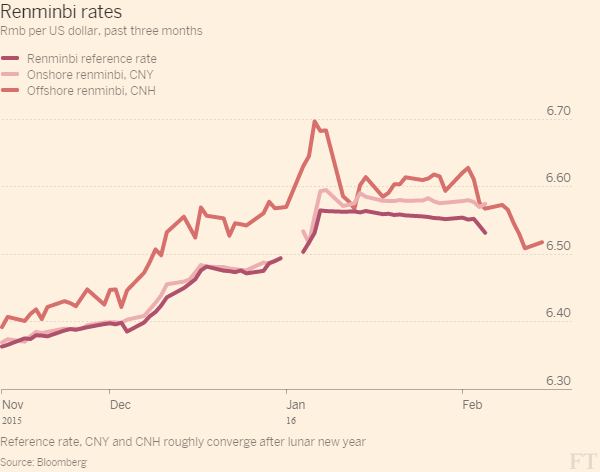 Who will help China fight deflation? In early February, as China celebrated the start of the Year of the Monkey, a widely circulated hedge-fund newsletter roiled financial markets by predicting a hard landing for the economy, the collapse of the shadow-banking system, and the devaluation of the renminbi. Stability returned only after People’s Bank of China Governor Zhou Xiaochuan, in an interview with Caixin magazine, explained the logic of China’s exchange-rate policy. But China’s ability to maintain that stability depends on a multitude of interrelated factors, such as low productivity growth, declining real interest rates, disruptive technologies, excess capacity and debt overhangs, and excess savings. In fact, the current battle over the renminbi’s exchange rate reflects a tension between the interests of the “financial engineers” (such as the managers of dollar-based hedge funds) and the “real engineers” (Chinese policymakers). Foreign-exchange markets are, in theory, zero-sum games: the buyer’s loss is the seller’s gain, and vice versa. Financial engineers love speculating on these markets, because transaction costs are very low and leveraged naked shorts are allowed, without the need to hedge an underlying asset. The exchange rate, however, is an asset price that has huge economic spillovers, because it affects real trade and direct-investment flows. Nowadays, financial engineers increasingly shape the exchange rate through financial transactions that may not be linked to economic fundamentals. Because financial markets notoriously overshoot , if the short-sellers win by pushing exchange rates and the real economy into a low-level equilibrium, the losses take the form of investment, jobs, and income. In other words, financial engineers’ gain is real people’s pain. In order to achieve these gains, financial engineers use the media to influence market behavior. For example, short-sellers portray sharp declines in commodity and oil prices as negative factors, even though lower energy prices actually benefit most consumers – and even some producers, by allowing them to compete with their oligopolistic counterparts. It is estimated that lower oil and commodity prices could add some $460 billion to China’s trade balance, largely offsetting the loss in foreign-exchange reserves in 2015. Similarly, China’s growth slowdown and the rise of non-performing loans are being discussed as exclusively negative developments. But they are also necessary pains on the path to supply-side reform aimed at eliminating excess capacity, improving resource efficiency, and jettisoning polluting industries. The real engineers, excluding those whose judgment is clouded by personal financial interests, should counter this influence, while refusing to succumb to the temptation of quick fixes. Fortunately, China’s authorities have long understood that a stable renminbi exchange rate is critical to national, regional, and global stability. Indeed, that is why they did not devalue the renminbi during the Asian financial crisis. They saw what most analysts missed: leaving the US dollar as the main safe-haven currency for global savings, with near-zero interest rates, would have the same deflationary impact that the gold standard had in the 1930s. In the face of today’s deflationary forces, however, real engineers in the world’s major economies have been unwilling or unable to reflate. The United States, the world’s largest economy, will not use fiscal tools to that end, owing to domestic political constraints. Europe’s unwillingness to reflate reflects Germany’s deep-seated fear of inflation (which underpins its enduring commitment to austerity). Japan cannot reflate because of its aging population and irresolute implementation of Prime Minister Shinzo Abe’s economic plan, so-called Abenomics. And China is still paying for the excessive reflation caused by its CN¥4 trillion ($586 billion) stimulus package in 2009, which added over CN¥80 trillion to its own debt. Meanwhile, the consequences of financial engineering are intensifying. Zero and negative interest rates have not only encouraged short-term speculation in asset markets and harmed long-term investments; they have also destroyed the business model of banks, insurance companies, and fund managers. Why should savers pay banks or fund managers 1-2% intermediation costs when prospective returns on investments are zero? A system in which financial intermediaries can increase profits only by increasing leverage – sustainable only by increasing quantitative easing – is doomed to fail. Indeed, in hindsight, it seems clear that financial engineers outperformed the real economy only with the support of super-financial engineers – that is, central banks. Initially, balance-sheet expansion – by $5 trillion since 2009 – provided banks with the cheap funding they needed to avoid failure. But bank deleveraging (brought about by stiffer regulatory requirements), together with negative interest rates, caused financial institutions’ equity prices to fall, leading to further pro-cyclical destruction of value through price deflation, increasing illiquidity, and crowded exits. Past experience has taught China’s real engineers that the only way to escape deflation is through painful structural reforms – not easy money and competitive devaluation. The question is whether the US and other reserve-currency countries will share the burden of maintaining global currency stability, through an agreement resembling the 1985 Plaza Accord , in which five major economies agreed to depreciate the US dollar against the Japanese yen and the German Deutsche Mark. If not, why would Asia’s net lenders, especially China, continue funding speculation against themselves? The US dollar is a safe haven, but savers in need of liquidity still lack an impartial lender of last resort. Depositing in reserve currencies at near-zero interest rates makes sense only if the banker is not funding financial speculation against the depositor. But, as it stands, financial engineers have a lot of freedom; indeed, if they are big enough, they can’t fail or, apparently, even go to jail. China’s G-20 presidency this year offers an important opportunity to emphasize that renminbi stability is important not only for China, but also for the global financial system as a whole. If the US dollar enters into another round of revaluation, the only winners will be financial engineers.